Next time you hold an electronic receipt, be cautious. 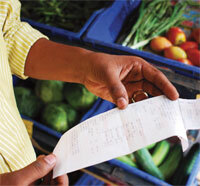 Bisphenol A found in thermal paper used in receipts from cash registers can enter a person’s body and cause harm. The compound is also used in food and drink packaging. In thermal paper the compound exists as a free monomer, which makes it easier for the body to absorb than other forms found in food packaging. The compound acts as an endocrine disruptor and mimics the effects of oestrogen in the body. Tracts of land were used for producing crops long before anyone kept records of the physical and chemical properties of the soil. It is impossible to go back in time and analyse the effects agriculture had. Now using a computer simulator, a soil scientist, has compiled a yearby- year effect of 100 years of agriculture on claypan soils in American farms. Claypan is a dense, semi-permeable layer in the subsoil. The data will help develop strategies to protect and restore soil fertility. He analysed soil properties of two claypan fields—a never-farmed and a field under cultivation for a century. He also made use of satellite images and photographs taken between 1930 and 1990 of the land. Considerable changes were found in soil fertility and pesticide runoff throughout the century, including 39 per cent drop in corn and 75 per cent drop in soybean yields. 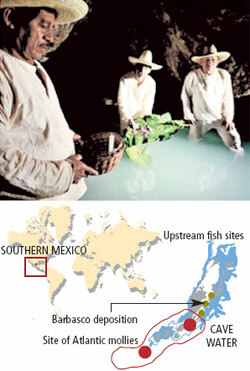 For centuries indigenous people in southern Mexico have poisoned a cavefish, Atlantic mollies, as part of a tradition. Now the fish have become wiser and evolved resistance to the toxin showing that human-induced environmental change can affect evolutionary trajectory of populations. The Zoque people annually travel into a sulphuric cave and pour into the waters a paste made of leaves of lime and root of the barbasco plant. Barbasco is a natural toxin for fish. Ecologists studied the long-term effects of barbasco on the fish. They found the mollies annually exposed to the toxin were 50 per cent more resistant to toxic waters than the fish upstream. They also passed the tolerant genes to their offspring. Soccer-ball-shaped molecules of 60- linked carbon atoms, buckyballs, have been found in the exploded remains of stars and in interstellar space. Scientists had speculated these balls, which act like traps for other molecules and atoms, might have carried substances to Earth, which started life. 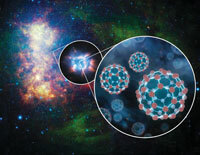 The discovery shows buckyballs are much more common and abundant in the universe than initially thought. Spotting buckyballs in interstellar space also reveals that relatively big molecules can persist between the stars. These molecules were detected by NASA’s Spitzer Space Telescope. Lousy at maths? Don’t worry. 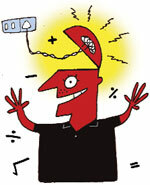 An electric shock is all you need. Scientists have found a method that improves a person’s maths abilities without affecting other cognitive functions. The method known as transcranial direct current stimulation passes a mild electric current, enough to light a lightbulb, through the skull into the brain’s parietal lobe, where numbers are processed. The effect lasts for six months. The research could treat nearly 20 per cent of the population with moderate to severe maths disability. Loved Avatar, the film? But fed up of goggles. Researchers have developed a holographic system that displays three dimensional scenes in real time. These images can be seen with naked eye and are similar to how humans see the environment around them. This will also help in medical imaging, tele medicine and performing operations in real time. The system records images using an array of cameras. 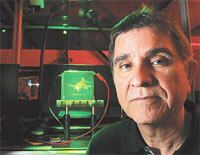 It is then encoded onto a fast-pulsed laser beam, which is made to interfere with another beam. The interference is written onto a photo refractive polymer which stores the images creating 3D effect. 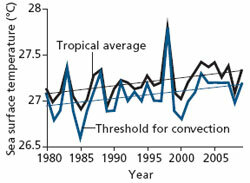 Hurricanes and tropical thunderstorms occur when sea-surface temperatures rise above a threshold. Now the bar that growing storms must cross to become full-blown hurricanes is increasing due to rising ocean temperatures caused by global warming. As a result, hurricanes and other tropical thunderstorms could become more intense, though the number may not change. To detect the annual changes in the threshold sea-surface temperature, scientists analysed satellite estimates of tropical ocean rainfall spanning 30 years. They found the threshold for storm formation has been rising at the same rate as that of the temperature of tropical oceans— 0.1oC per decade. In what can provide faster diagnosis, scientists have developed a blood test that detects ectopic pregnancy in a day. 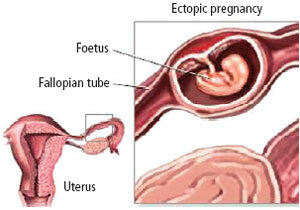 Ectopic pregnancy occurs when foetus is implanted in fallopian tubes. Ultrasound can identify it but sometimes embryo is too small. A test to measure levels of hormone, human chorionic gonadotropin, also takes time. The new test measures levels of placental growth factor (PIGF), a key molecule in the formation of blood vessels. Levels of serum PIGF are reduced in ectopic pregnancies. Iron fertilisation —sprinkling iron in the sea to spur the growth of carbonabsorbing phytoplankton— can turn water toxic. The method used to combat global warming can spur growth of toxic alga Pseudonitzschia thought to be limited to coasts. Scientists have found they are common in open sea. They are highly responsive to iron, becoming dominant in algal blooms. They generate toxic domoic acid which kills marine life. Scientists have created a global map showing sources of atmospheric moisture. 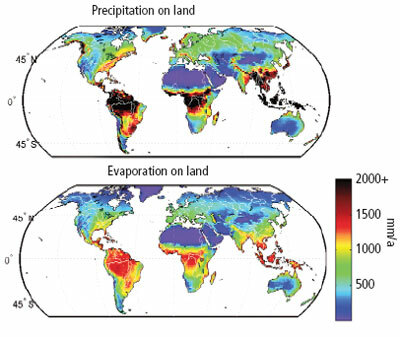 They found that on average 40 per cent of terrestrial precipitation originate from land evaporation and 57 per cent of all terrestrial evaporation returns as precipitation. Some regions rely on water recycled from within the region, while others get moisture from different regions. The study suggests that land use changes such as irrigation, dams, and deforestation can alter evaporation patterns in a region, potentially affecting water resources globally.